Can you imagine how much Bugsy fun can be had with this many splurge foam cans? This great discount is for the bulk purchase of 100 cans of splurge only. Splurge foam is a non toxic white foam which dissolves after a few minutes. No Bugsy Malone production is the same without it. Bulk discount splurge cans – This is a bulk discount for 100 cans of splurge. Each can contains non-toxic white foam which dissolves after a few minutes. It’s to be used with our Bugsy Malone Splurge Guns. 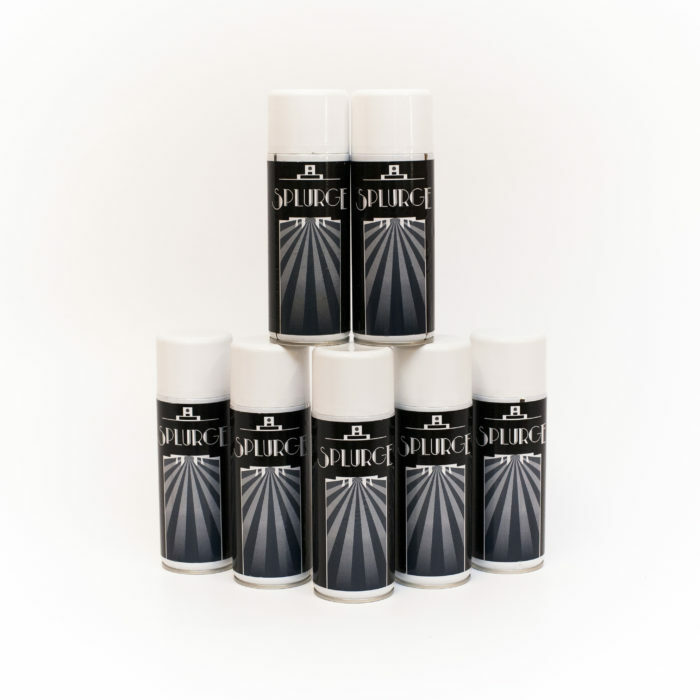 Each splurge can delivers just over 1 minute of splurge foam and sprays about 3 metres. The splurge foam is great fun but does require management. If cleaned up while wet it generally won’t stain however, if left it may do. The foam washes out of most clothes. Some dry cleaning chemicals do not remove it though and items need to be hand rinsed in lukewarm water. Avoid spraying onto curtains or soft furnishings as it may leave a white residue and these items, due to their size, can be difficult to clean. Best way to deal with the splurge on stage is to have a team of helpers ready to deal with the clean up as soon as the show is over and also, to avoid any slips on stage, use your characters wielding mops to mop up the floor while the production is on. Another important point to remember is to not spray splurge directly into people’s eyes as it can sting. Please note, unfortunately we can not offer refunds for returned cans of ‘splurge’.